Having recently reread Different Drummer, Jann Parry’s biography of Kenneth MacMillan, I was full of anticipation at the prospect of seeing MacMillan’s Anastasia, a work that traces the story of Anna Anderson, who believed (wrongly it eventually turned out) that she was the Grand Duchess Anastasia who had survived the murderous attack on her parents and siblings, the Imperial Russian family, by Russian revolutionaries in 1918. Parry’s account of the various problems that surrounded the creation and casting of MacMillan’s ballet, which began as a one act work for Deutsche Oper Ballet in Berlin in 1967, was absorbing reading. I guess more than anything else, I came away from the performance with renewed admiration for MacMillan’s classical choreography, clearly on view in the first two acts, which were added when MacMillan transformed his one act work into a full-length one in 1971. I loved the way he handled groups, as in the ball scene in Act II where a large corps of swirling dancers wove their way across and around the stage in ever fascinating curving, threading, and criss-crossing patterns. I was also impressed with his use of a kind of canon-style of movement throughout, but especially in Act I where his approach to the choreography for Anastasia’s three sisters stood out. And I admired his pas de deux in Act II which, although it seemed somewhat as though it had been inserted in order to have a grand pas de deux in the ballet, was beautifully lyrical and smoothly integrated within itself—there was no stopping and restarting to separate pas de deux from variations from coda, for example. It also had some breathtaking moments, including that astonishing tilt of the full body by the ballerina as the pas de deux began. 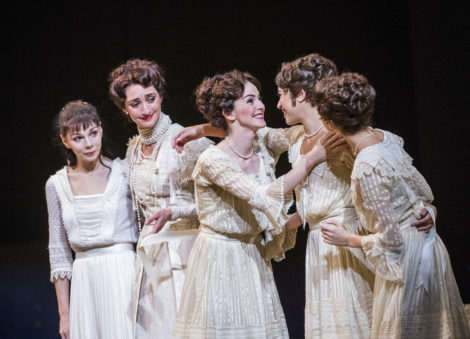 I also admired Bob Crowley’s designs, which in terms of costumes ranged from opulence in the ball scene to stripped back simplicity in Act III, the scene in the hospital/asylum where Anna/Anastasia relives her life. His set designs were also worthy of admiration, with the inherent drama of Anna Anderson’s mental state being foreshadowed with the tilted shapes of the ship on which Act I takes place, and the chandeliers of the palace in Act II, captured forever in mid-swing. As for the dancing, I saw Lauren Cuthbertson as Anna/Anastasia partnered by Thomas Whitehead as the officer to whom she was attracted in Act II and as her husband in Act III. Cuthbertson was charmingly youthful in Act I and handled Act II nicely as she welcomed and interacted with guests at her coming of age ball. But she and Whitehead didn’t really suit each other as partners, largely because their physical attributes are quite different: Cuthbertson is taller and finer in build and more classically proportioned than Whitehead. As a result, the emotional connection that was needed between them was not as powerful as I would have hoped. 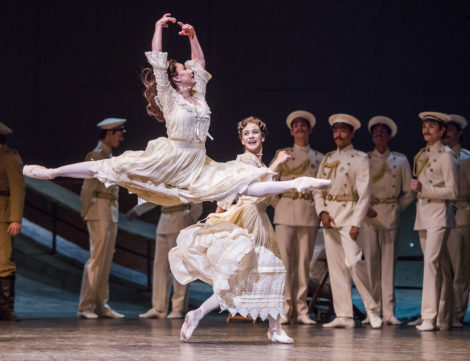 Sarah Lamb dancing with Federico Bonelli, as Mathilde Kschessinska and her partner (not given a name in the story’s cast of characters), sailed through the difficult choreography of the pas de deux in Act II making it all look easy. Great to watch. 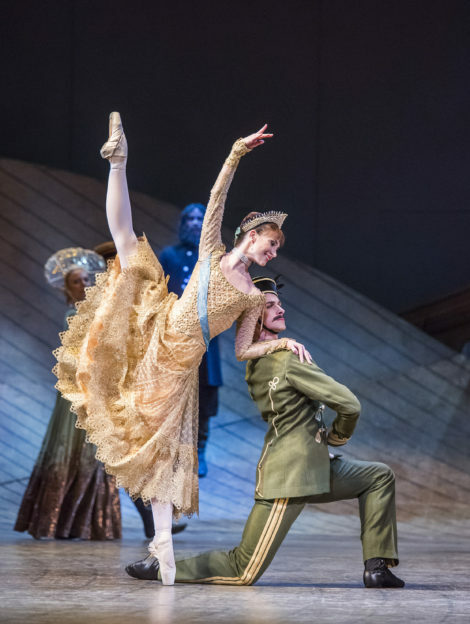 Another Act II highlight was the quartet between Kschessinska and her partner and Tsar Nicholas II, played by Gary Avis, and his wife the Tsarina Alexandra Feodorovna, danced by Itziar Mendizabal, in which personal relationships within the royal court were brought into question. Anastasia hovered in the background, wondering. As Rasputin, Eric Underwood was moodily present throughout, taking part in the dancing at times, hovering darkly at others. Rory Thomas as the Tsarevitch Alexey, the sickly child and brother to Anastasia and her sisters, handled his role with aplomb. The production itself, however, which was realised by Deborah MacMillan and staged by Gary Harris, wasn’t entirely satisfying. 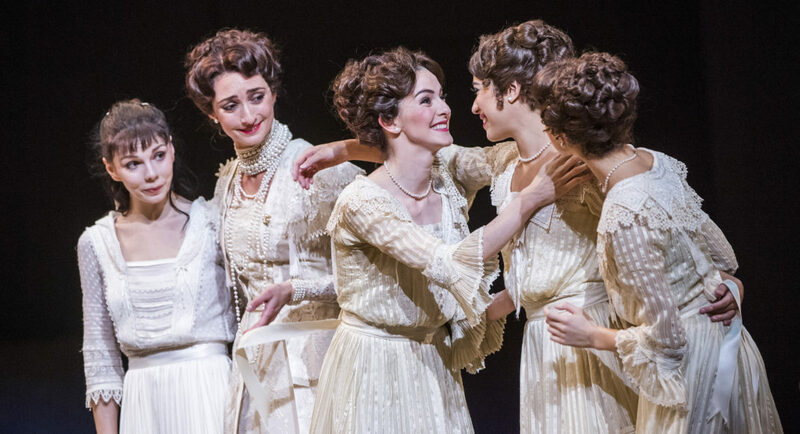 The third act looks back to the first two acts as Anna relives scenes, largely horror scenes from her life as the Grand Duchess Anastasia, and as we see characters from this earlier life move across the stage in front of her eyes. But, as there is a such a clear and strong disconnect stylistically between the first two acts and the third when MacMillan draws so strongly on a contemporary, expressionist mode of dancing, albeit with Anna in pointe shoes, it is hard to reconcile the notion that the last act is part of the same ballet as the first two acts. 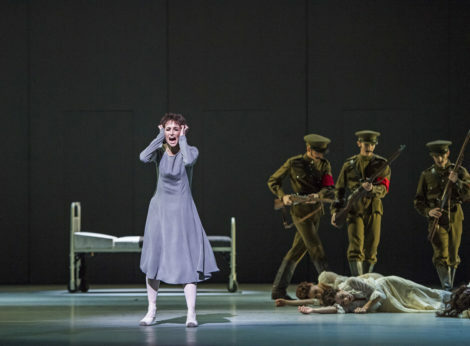 Design-wise the third act is superb with its stark grey walls and its single iron bed, and choreographically it is mostly quite gripping. But as I left the theatre, having felt the power of the work at many points, I nevertheless wondered whether it would not have been better to have left Anastasia as a one-act production. Another note for my Australian readers: As the image of the pas de deux in this post indicates, Sarah Lamb usually dances as Kschessinska with Steven McRae as her partner. McRae was replaced at the last moment by Bonelli.